A comprehensive course effective for those with previous training such as I, or those new to firearms. Dinan's pesky and thought provoking style keeps the course interesting and provocative. The student is not only trained in the effective use of a firearm, but given a excellent background in the applicable law. The personal touch utilized by the instructor made me a better shooter than even my NYPD Training. This professional course leaves nothing to chance and thoroughly prepares one in the safe and effective use of a weapon. I highly recommend it! I first took a firearms course from Jim Dinan in 1984. Since then, I have probably taken every course he offers. The latest was an NRA Training Counselor Workshop he sponsored last Spring (2001). My first impression of Jim was that he combined a thorough knowledge of firearms with a rare talent for teaching the subject. I have never had cause to change that opinion. I had had some prior training in small arms in Army ROTC and the U.S. Air Force. Since I met Jim, I have also attended the Suffolk County P.D.’s Auxiliary Police training course and Massad Ayoob’s Judicious Use of Deadly Force course (Lethal Force Institute). So, based on my experience with a variety of instructors, all of whom I respect, I would say that Ayoob and Dinan stand out. Both are feisty, opinionated, and right! Dinan is the Massad of Long Island in my opinion. You don’t have to go to New Hampshire to receive quality firearms training It’s available right here. Jim is a distinguished marksman, a distinguished teacher, and, I’m proud to say, a great friend. Thank you Jim. When I decided to obtain a NYS armed guard license, I was referred to Jim Dinan by the local sports shop who I dealt with for many years. After taking Jim Dinan’s class I realized the old saying “you don’t know what you don’t know” could not be more appropriate. The course detail and reinforcement Jim put into the class is second to none; if you wish to go this route, you want that attention to detail communicated till you get it, if you want it “Sugar Coated” go some where else. As for the development of shooting skills; my dad once told me “Keep you eyes and ears open and your mouth shut and you might learn something”. I have been a Single Action Cowboy shooter for almost 30 years, it’s a lot more fun when you can keep picking off you targets with the best of them. Let Jim teach, lead and train, you will realize your time well spent. 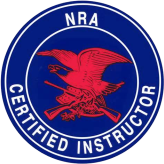 I would like to express my appreciation for the time and the professionalism you put into educating me in the firearm training class. It takes discipline to be effective. It takes knowledge to be equipped for better performance. It takes skill, practice and education to become competent responsible person(s). You make that possible by the contribution you made toward making me that individual. Speaking for myself and, I think for most of your students “Thanks” this was truly an uplifting experience for the morale. I was highly recommended to the James Dinan School of Marksmanship so that I would learn the proper handling of a handgun for home/personal protection. As a result of this training I succeeded in developing great competency and skill. I have also learned to enjoy target shooting as a sport. I would highly recommend the James Dinan School of Marksmanship for anyone considering learning the important skills associated with handling a handgun and marksmanship. My wife and children received invaluable training in safety and marksmanship, as I also did, at your training program. The value of the ongoing training and field experience which you provide on a regular basis is immense. Thanks. I received my training for instructor certification from Mr. Dinan over ten years ago. Although I have received training from both Nassau and Suffolk County Police Depts. and Massad Ayoobs Lethal Force Institute, the James Dinan School is the ultimate in training! To this day I am still learning valuable secrets in the art of marksmanship from Mr. Dinan. I credit my excellent shooting ability to Jim and I feel he is the best instructor around! Having relocated in Georgia, I recently became a Kennesaw University Police Officer. I had to complete the academy and learn the Georgia Law and receive firearms instruction. My prior instruction and training I received from Jim Dinan gave me a huge advantage over all the other students. I consistently out shot all the competition. Jim Dinan,s emphasis on the front sight set me apart from the rest! Most of the class could not hit the target from twenty five yards. Thanks Jim! I attended the James Dinan School of Marksmanship because I enlisted in the Coast Guard and I wanted to familiarize myself with pistol shooting before basic training. Until then I had no shooting experience. In James Dinan's classroom I learned the importance of sight alignment and trigger control, along with other rnarksmanship fundamentals. Before leaving for the Coast Guard, I practiced some of the techniques I learned in the classroom with a pellet gun in my backyard. The first time I fired a real pistol was in basic training. I qualified as a Marksman my first time shooting at the range. Only 10 out of 17 qualified in my company. I scored higher than some of my shipmates who were cops or had prior military service experience. I feel the James Dinan School of Marksmanship prepared me efficiently for my pistol qualification. When encouraged to pursue a certification as an NRA Pistol Instructor last year, I was cautioned that finding an excellent Training Counselor was no easy thing. I believe I have found one in Jim Dinan. He has excited in me a new desire for the disciplines of the “shooting game”. As a 9 yr Army veteran, I have enjoyed his Marine Corp style of training. Through this I have come to know a new standard of excellence in my personal shooting goals. He has the ability to communicate with understanding the importance of the fundamentals coupled with the details and disciplines that have made men experts. The James Dinan School of Advanced Pistol Shooting is well equipped to meet the training needs of any individual looking to make every shot count. Both the school and Jim’s reputations live up to the motto on a plaque displayed in his classroom, “Semper Fidelis” Thanks. In 1986, after being trained in the S.C.P.D. Auxiliary (volunteer) Police Program, I called James Dinan to request Instructor training. Just being trained by S.C.P.D., I thought I was Really Good! Jim said. “Why do you think you are Good Enough to become an Instructor? Even with your other training, you Must attend my basic Marksmanship course first.” Which is exactly what I did, and after just 10 minutes in his class I realized the caliber of shooting instructor I was now dealing with, and my shooting skills soared. My association with Jim Dinan commenced in 1963, when as a rookie with the S.C.P.D. I had difficulty qualifying with my duty revolver. Jim, then a firearms instructor with S.C.P.D., took the time and trouble to instruct me on his days off. After a few sessions, I was able to qualify as a Marksman, and soon achieved Distinguished Expert. Over the years I have continued to train with Jim, and I continue to improve and learn something new from him at every session. During the past forty-five years of handgun use, I have had many instructors in the military and at police departments, and Jim Dinan is clearly the finest instructor that I have had the pleasure to work with. Been attending James Dinan School of Marksmanship ever since retiring from the Police Department in 1990.His school for Security Guards and firearms instruction is one of the best in the state. I had been shooting competitively for a number of years before I took Jim's instructor's courses. I really learned a lot. Jim is very personable and professional. Highly recommended. The training I received from the Dinan School was superior. I doubted I would find such a high quality firearms instructor in the New York area, but I was wrong. I was able to progress from a novice pistol student to an instructor in just 18 months by working hard, staying focused, and most importantly, by listening to everything Jim Dinan taught me. Jim Dinan is like no instructor I've every met. He of course starts by teaching the fundamentals of safety and basic shooting fundamentals, but also goes far beyond what a particular course calls for. He believes in pin-point accuracy whenever someone pulls the trigger of a handgun, and he teaches every student 'exactly' what they as - an individual - needs to know in order to obtain that accuracy. Attending one of his classes will help any shooter obtain higher marksmanship scores, no matter what they think their starting skill level is today. I would like to express my appreciation and gratitude for the unparalleled firearms training that you provide. Within just a short time of attending the James Dinan School of Marksmanship my skills improved dramatically. Your professional teaching skills and unwavering emphasis on the fundamentals of marksmanship are priceless to any shooting enthusiast eager to learn. I truly enjoyed the time spent in your classroom and look forward to receiving some additional training at your school in the very near future. Thanks again for the superior training, I will continue to recommend you to my fellow shooters at the local range. Joanne & Al E. - Long Island & Yulan N.Y.
We were NRA certified instructors for more than a decade in 1985, when curiosity brought us to the James Dinan School. So many of our students had mentioned the school so favorably, we had to find out for ourselves what was going on. After just a few minutes as members of a class, we realized the amazing capabilities of Mr. Dinan. He is to firearms training what the highly successful immersion technique is to foreign language training. Whether a student's interest is marksmanship, self-defense, security, or all of them, one cannot consider one's training complete without a few sessions with Mr. Dinan. We certainly benefited and continue to benefit from the James Dinan School in 2003. I had been handling/shooting guns for over 30 years before I met Jim Dinan (and was quite satisfied with my skills up till then). But only as a consequence of taking his NRA Certified Instructor's Course for Pistol/Firearm safety/Personal Protection; did I learn how to shoot accurately (and quickly when necessary). The time spent on the range with him (and the class), was like having a personal Olympic coach diagnosing one's weak points and proposing the cure. I still look forward to his annual competition/training sessions to continually improve my humble skills. He can shoot and he can teach & most importantly, he can teach you to do the same. In 1995, a friend got me interested in pistol shooting and after I received my license he proceeded to out-shoot me every time. A few months later I found out about The James Dinan School and took his ten hour class "Advanced Pistol Marksmanship." WOW! I learned how to shoot the correct way and was now out-shooting my friend. When I had questions, Jim would answer them and coach me over the phone. At one point, I was shooting one handed on a bull's eye target, while putting 8 out of 10 shots in the 5" black at 25 yards. I demonstrated this to Jim and asked " How do I get the other 2 in the black?" Jim then proceeded to tell me how to, and also stated that I'm the only student he's taught who has shot 1700 out of 1800 the first time at one of his outdoor shooting events. 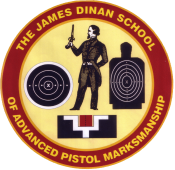 The James Dian School of Advanced Pistol Marksmanship is the place to go for superior instruction and marksmanship training. All that's required is your attention and a willingness to learn. Jim Dinan has over 40 years of marksmanship training experience and is more than willing to share iit with each and every one of his students. All levels of experience are welcome. I came to his pistol class over 20 years ago, and have gone back many times, earning instructor ratings in pistol, rifle, shotgun, home firearm safety, and personal protection. Using the techniques acquired at the James Dinan school has helped me successfully compete in all types of firearm competitions and has added to the enjoyment of owning a firearm. If you are serious about firearm safety and training (and you should be!) there is no one else out there that can offer you what Jim can.